Let’s be honest—Every bride knows when it comes to the perfect wedding, it’s all about the dress! Here at One Price Dry Cleaners, Cape Coral we want to make sure your perfect gown remains perfect. Accordingly, we now offer various services that will surely cater to every bride’s need! 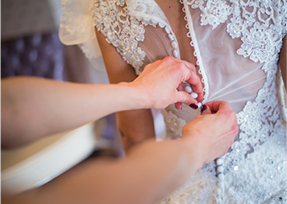 Whether it’s alterations/touch-ups before the ceremony or cleaning/ preservation after the momentous occasion, One Price Dry Cleaners Cape Coral is here to help! So DON’T DELAY—Trust One Price Dry Cleaners to retain the brilliance of your Wedding Gown for years to come! Price List for Wedding Gown Cleaning! AND at an UNBELIEVABLE PRICE! SUPERIOR SERVICE for MINIMAL COST! Bought the perfect dress but need alterations? NO PROBLEM! 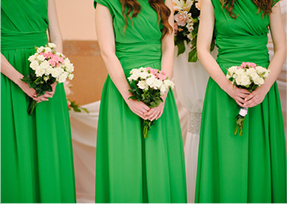 Tailoring your dress for the next bride-to-be? NO PROBLEM! We now have on-sight tailoring at the Cape Coral location for wedding and bridesmaid’s dresses! Questions, Concerns, or Need an Estimate? One Price Dry Cleaners Cape Coral strives for complete customer satisfaction so stop by anytime and speak to one of our specialists—We’re more than happy to answer all your questions and concerns—and provide you with AFFORDABLE QUOTE! YOU NAME IT — WE CLEAN IT! The Perfect Dress is Something worth Maintaining! Save the Gown for Memories or Pass it down for Future Generations –Preserve and Store your perfect Wedding Dress for a LIFETIME! 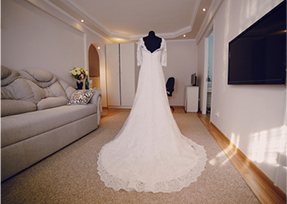 One Price Dry Cleaners Cape Coral wants to makes sure that your Wedding Dress is Clean, Well-Maintained, and Perfectly White! One Price Dry Cleaners Cape Coral stands by our Preservation and Cleaning Process so that your Wedding Gown remains as*Perfect* and *Brilliant* as the day you bought it!